Do I know the history of the seat? A seat that comes from a best friend or family member is a very different thing than a seat that is purchased at a garage sale – the history of the seat is available. If the history of the seat is unknown, do not use it. Has the seat ever been in a crash? If it has, discard and do not use. Is the seat within its expiration date? (Usually 6 years from date of manufacture – check your owner’s manual for information on your seat.) If it’s not, it’s time for a new seat. Does the seat have all of its parts? The owner’s manual will have a listing of all parts. If you are missing any and can pass the first three steps, call the manufacturer for replacement parts. Remember, you are, TRUSTING this seat with the LIFE OF YOUR CHILD! If in doubt, swap it out! 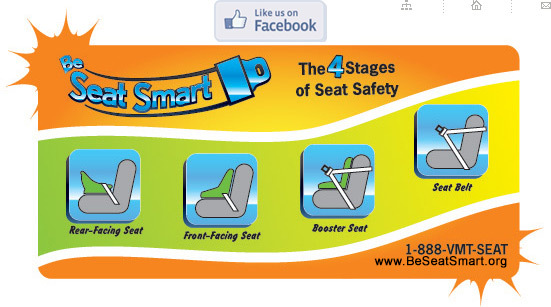 Call 888-VMT-SEAT for help! Expired seats: Sometimes expired seats are seen at our fitting stations and inspections. When talking with parents and care givers, we frequently hear “I don’t believe that I need a new one – it’s just marketing on behalf of the manufacturer in order to get me to buy another. “ This is simply not true – seats have good reasons for their expiration dates. Car seats live in extreme environments, the very hot and very cold of a car. These temperature swings cause the plastic, over time, to become brittle and fail which can cause the harness to pull through the shell of the car seat and eject the child. If your seat is expired, STOP!!! DO NOT USE IT. Call 888-VMT-SEAT for help.